this post is titled 'quick draw' but I'm not sure if that's technically accurate. I think a quick draw is supposed to be only a few minutes, if there's a standard. 3 hours is less time than I usually take, though. We've reached a milestone here, guys. I have finally ... finally ... made a drawing on my own. That is, I was not just copying a picture I found on the internet, or in a book. The pose, color selection, and so on were pretty much made up by me as I drew. Behold! It's messy, it's clumsy, and it's one of the poorest drawings I've made in the last 6 months, but I did in fact make it myself. We're also going to do something different this time. Normally for these posts, I'll include a grid of about 9 screenshots taken over the course of drawing it, so that you can see it get made. While I was drawing this one, I recorded a time-lapse video instead. Then I added a spicy ska song with Windows Movie Maker. Check it out. Watching on YouTube is recommended; I don't know how to make this box bigger. It was definitely a lot of fun to do. Keep in mind I'm a total beginner at this; there are a lot of people who do amazing drawings and will post time-lapse videos of them, both to exhibit their work, and to help others learn from it. This is ... neither; I just thought it would be a different and better way to record progression. As you watch you'll see me mess up, go too fast, and do a lot of things wrong. After doing so many cabon-copies, I finally felt like I understood the "basics" enough to try making one from the ground up. I crossed my fingers, covered my face with one hand, and decided to try. The only time I looked at reference pics was when I forgot where certain colors went (like on the arms), and that sort of thing. I didn't want to get too ambitious on a first try, so I tried to keep it "quick and dirty". I aimed for a relatively short completion time of 2-3 hours, and tried to avoid doing things like constant erasing. This caused me to rush it a bit, and not fix a few things, which can be seen in a few areas. I'm particularly displeased with the boots, which I practically raced through and didn't take the proper time to "web" them right. They look really flat and scraggly, and I wish I had put more time into them. 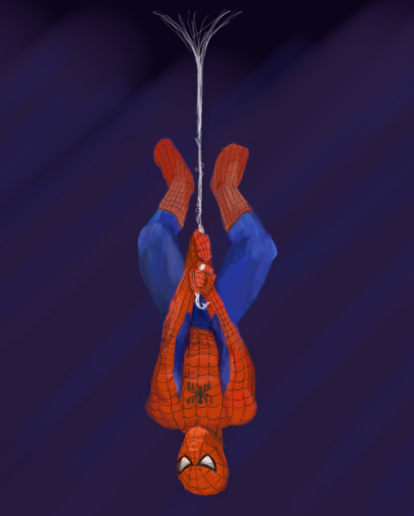 The costume webbing in general was a bit of a challenge. I did a few things right (or at least think I did), though. The highlights and shadows went better than expected, particularly on the arms/upper body. It's strange that my memory of drawing them is particularly fuzzy, but yeah -- they seem to have pretty good definition. Proportions on the rest of the body seem okay, and after multiple tries, I think I got the legs looking right, where shape is concerned. Hopefully the next drawing will be something more complicated, so that I can take more time and ideally have it come out better. I'm not sure what it'll be yet.